Catches mail and serves it through a dream. Catches all mail and stores it for display. Shows HTML, Plain Text and Source version of messages, as applicable. Rewrites HTML enabling display of embedded, inline images/etc and open links in a new window. Lists attachments and allows separate downloading of parts. Download original email to view in your native mail client(s). Command line options to override the default SMTP/HTTP IP and port settings. Mail appears instantly if your browser supports WebSockets, otherwise updates every thirty seconds. Runs as a daemon run in the background. Sendmail-analogue command, catchmail, makes using mailcatcher from PHP a lot easier. Written super-simply in EventMachine, easy to dig in and change. Use mailcatcher --help to see the command line options. The brave can get the source from the GitHub repository. Please don't put mailcatcher into your Gemfile. It will conflict with your applications gems at some point. Instead, pop a note in your README stating you use mailcatcher. Simply run gem install mailcatcher then mailcatcher to get started. If you've installed via RVM this probably won't work unless you've manually added your RVM bin paths to your system environment's PATH. In that case, run which catchmail and put that path into the sendmail_path directive above instead of /usr/bin/env catchmail. A fairly RESTful URL schema means you can download a list of messages in JSON from /messages, each message's metadata with /messages/:id.json, and then the pertinent parts with /messages/:id.html and /messages/:id.plain for the default HTML and plain text version, /messages/:id/:cid for individual attachments by CID, or the whole message with /messages/:id.source. Mail processing is fairly basic but easily modified. If something doesn't work for you, fork and fix it or file an issue and let me know. Include the whole message you're having problems with. The interface is very basic and has not been tested on many browsers yet. Add mail delivery on request, optionally multiple times. Compatibility testing against CampaignMonitor's design guidelines and CSS support matrix. Forward mail to rendering service, maybe CampaignMonitor? 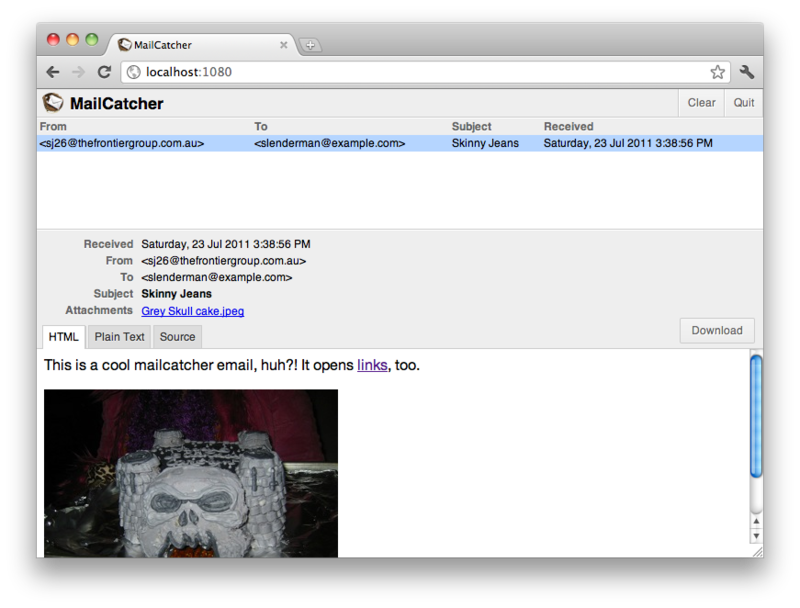 MailCatcher is just a mishmash of other people's hard work. Thank you so much to the people who have built the wonderful guts on which this project relies. Thanks also to The Frontier Group for giving me the idea, being great guinea pigs and letting me steal pieces of time to keep the project alive. I work on MailCatcher mostly in my own spare time. If you've found Mailcatcher useful and would like to help feed me and fund continued development and new features, please donate via PayPal. If you'd like a specific feature added to MailCatcher and are willing to pay for it, please email me. Copyright © 2010-2011 Samuel Cochran (sj26@sj26.com). Released under the MIT License, see LICENSE for details. For dream catching, try this. OR THIS, OMG.